Soccer, Cricket, and Rugby are some of the most popular sports in South Africa. Baseball is not among the most popular sports in South Africa, in fact tennis, golf, surfing, and track and field are also considered to be more popular sports than baseball. Popularity didn’t stop South African and Seattle Mariners prospect Dylan Unsworth from picking up a baseball at a young age and now today he dreams of becoming the first South African to reach the major leagues. One of the main reasons for Unsworth interest in baseball came from his family; his father and uncles played softball and his family noticed how a very young Unsworth was attracted to the smaller sized baseball. As a youngster, it was his father who taught him all about baseball, the two would work together on fundamentals. It was also Unsworth’s father who discovered that there was club baseball near their hometown of Durban where Unsworth and his brother could play the game. As he began to play, he knew he wanted to become a professional baseball player. It was a challenge for Unsworth with few organized leagues, as baseball did not exist at the high school and college level. As a 16-year-old, Unsworth got a great opportunity to attend the MLB European academy in Italy. Many teams send scouts to the academy to see some of the top talent from other countries from around the world. At the academy he caught the eye of Mariners scout Wayne Norton. While Norton wasn’t there to sign him, the two had an opportunity to speak and Norton offered the young pitcher encouragement to keep working hard. Just a few weeks later Unsworth got more good news, South Africa selected him to be a member of their World Cup team. Representing his country, Unsworth pitched well including an outing against the Cuban team in Barcelona. Unknown at the time to him, Wayne Norton flew to Barcelona and got another good look at Unsworth pitch. When he returned home the Mariners paid him a visit and he signed a contract to begin his professional journey to the major leagues. At just 17 years old, Unsworth packed his bags and headed to a new country chasing his dream of becoming the next Tim Lincecum or Jared Weaver, two of the pitchers he has enjoyed watching during their careers. He made his professional debut in June of 2010 as a member of the Mariners Arizona League team. In 10 starts and 50 innings of work, Unsworth put up one of the more incredible statistics for someone of any age in professional baseball. He faced 214 batters and only walked one batter all season. It was very clear that the control that his father started to teach him at a young age was going to play a very important role in Unsworth’s rise through the minor leagues. In 2011, Unsworth got some more work in extended spring training before being promoted to the organizations more advanced rookie league affiliate in Pulaski. In 12 starts and 61 innings, he compiled a 6-5 record with an ERA of 5.16 while still showing excellent control walking only 10 batters. At just 19 years of age the Mariners continued to challenge Unsworth promoting him to their Northwest League affiliate, the Everett AquaSox. The young right hander was two years younger than the average player in the Northwest league but proved up to the challenge putting up some of the best numbers of his professional career. Unsworth started 14 games and went 7-2 in the win-loss column. He continued to show excellent control while facing more experienced hitters. He finished the season with just 19 walks in 85.1 innings and a WHIP of just 1.113. One of Unsworth’s best performances came last year when he went 7 innings and struck out 12 vs Modesto. The Mariners promoted Unsworth yet again to start his 2013 campaign. As a member of the starting rotation for the Clinton LumberKings in the Midwest League, Unsworth continued to perform. In his 11 starts the hurler went 4-1 on the season including a complete game. In his 66 innings of work he continued to show insane control walking just two batters and finishing the year with a WHIP of 0.909. While he was not striking out batters at an alarming rate his walk totals have been unheard of earning him as the pitcher with the top control in the entire Mariners system according to Baseball America. Unsworth would face his greatest challenge yet in 2014. The Mariners promoted him at just 21 to the hitters haven otherwise known as the California League. Not only would Unsworth be facing the tough conditions and tougher competition but he also would see his innings and workload increase compared to his previous seasons in the organization. 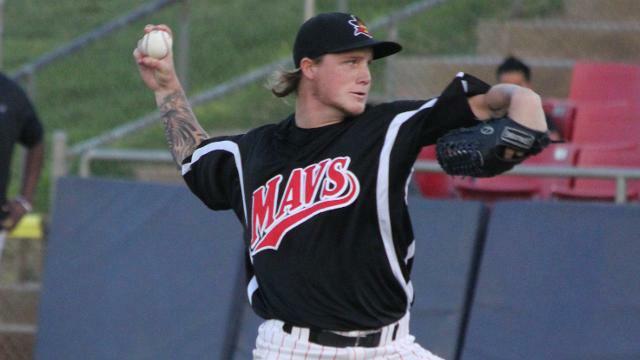 Playing with the High Desert Mavericks, Unsworth got the ball every five days and started 26 games. He pitched a career high 119 innings and had the best strike out numbers of his career averaging one per inning. Overall he did not see the success in the win-loss column he had in his last few seasons going 6-9, but he learned to trust his stuff and continue to follow his game play through the ups and downs of the season. As he faced adversity he still showed his excellent control walking just 19 batters in 119 innings. As 2015 approaches Unsworth looks forward to his next challenge as he works toward his dream of becoming the first South African to reach the major leagues. Unsworth and Gift Ngoepe, an infielder in the Pittsburgh Pirates organization currently are both working extremely hard at reach their dream goals. We will continue to follow Dylan all season long and into the future as he works toward his ultimate goal. 1. What is the game of baseball like in South Africa in comparison to what you have seen in the United States and where does baseball rank in terms of popularity in South Africa? We don’t really have any high school or college baseball basically if you want to pick up a baseball and learn how to throw and play baseball it’s really on you as an individual. In America growing up baseball is around everywhere. You grow up and it’s easy to know all about baseball and learn the game. In South Africa it’s all about Rugby, Cricket, and Soccer. Baseball comes way after them and numerous other sports. It’s barely ever talked about. Back home you train maybe Tuesday and Thursday where in America you can train and play all the time. I would have to say high school baseball would be the top-notch level of our teams back in South African which explains the level of our teams back home. 2. With all the other options as far as sports to play growing up, what made you pick up a baseball? My dad played softball for a lot of years including as a kid and he was a pitcher too. He discovered when I was about six or seven years old that there was baseball near Durban where I was born. So me and my brother gave it a shot. We started out playing T-Ball and continued playing baseball there. When I got to be about 12 years old I had decided that I really wanted to play professional baseball and I was going to give it my very best shot. Ever since that day I’ve never looked back and here I am now a member of the Mariners organization. 3. How did the Mariners discover you and who is the person in the Mariners organization that is most responsible for you signing with them? I had an opportunity to go to the MLB European Academy as a 16-year-old in Italy. Some of the best players around Europe get selected to go their and show their talents. There was a lot of scouts there and it was a once in a lifetime opportunity to get seen. I threw the ball well and did great. The Mariners had a scout there by the name of Wayne Norton. He spoke to me a little bit and just told me I had a great opportunity and that I just needed to keep working hard and pushing. I returned back home to South Africa and got selected to play in the World Cup. It was my first international experience. We went to Barcelona for the World Cup and I pitched great including an outing against Cuba. What I did not know was that Wayne Norton the Seattle Mariners scout was watching me. A week later as I was returning to South Africa the Mariners Wayne Norton and the Mariners scouts came to me and offered me a contract to sign. That’s how it all started! 4. What was it like for you to not only represent your country in the World Cup but also in the World Baseball Classic tournament? It was a dream come true. As a kid in South Africa I hoped that one day I would be one of the guys to be able to play for my country’s team. To actually be the starting pitcher in the World Baseball Classic qualifier it’s just crazy cause these were some of the very people in my own country I looked up to and now I was playing with them. It was such a thrill and just a great experience. To represent you own country in anything just is a different feeling. 5. After signing with the Mariners you came to the United States to start your professional career. Was it hard for you to adjust to a different country and environment as you also started your career in baseball? I wouldn’t say the adjustment was easy. I got here at just 17 and it was my first time in the United States. I knew there were going to be kids my age that had a lot more experience than I had. I got here and the first few weeks and first months were great and everyone was really nice in helping me adjust. There was still tough times though as a 16/17-year-old kid there was definitely times I was missing home. I missed mom and dad. Since baseball has been a dream all my life I found that when I was out on the baseball field. It helped me not worry about anything else since that is ultimately what I wanted to do with my life since I was a small child. 6. Over the course of your professional career you have shown some outstanding control. How have you been able to develop the outstanding control you have shown during your career? I really don’t understand it completely. I do know that my dad, when he used to pitch softball he was also really good at controlling the ball. While he has some speed behind him his main thing was he could throw strikes and change speeds with the softball. Growing up I learned from him that being a pitcher is all about doing those things. It doesn’t really matter if you can throw 95, if you’re putting it right over the plate the hitters are going to smash it. I try to change speeds and control my pitches, I think that ultimately is going to be what keeps me in the game. Velocity is always a big factor in a professional game but so is location, and pitching coaches and managers want you to be able to throw strikes. 7. Beyond your excellent control, what pitches do you throw and what your approach is on the mound? When I first signed I really only threw a fastball and curveball and the Mariners told me that a big part of my success would be if I could also learn the change-up. Coming over from South Africa, I did not really even know what a change-up was. I just wanted to get to work so every single day I worked at throwing it and throwing it some more. Today the change-up is one of my best pitches. It’s a great pitch and to be able to change speeds no matter what the count is can really fool a hitter. Being able to command it along with my fastball so well is really like adding another weapon to my pitches on the mound. I’ve also tried over the last few years to improve the curveball and learn the cutter as well. They have gotten a lot better over the last couple years. The hope is that I can become a four pitch guy. 8. Is there a particular coach or instructor that has really helped you in your development in the Mariners organization? There has been a lot of pitching coaches that have had side talks with me and have watch me and tried to offer recommendations of things I could do in order to keep growing and become a major league pitcher. Andrew Lorraine who I’ve had as a pitching coach the last couple of years has done a tremendous job. He has pushed me to extreme limits and has been really great. Rich Dorman was my pitching coach in Everett in 2012 he was a really great pitching coach as well. He has helped me a lot and I learned a lot from him not only about being a better pitcher but also about being a better person. Those two and many other coaches have really been there for me. 9. Both you and Gift Ngoepe are both South African’s playing professional baseball. Do you each try to do things back home in South Africa to promote the game? We are both from different cities in South Africa and its a long drive between them. We are buddies and we do talk from time to time. Gift has been doing a lot of training in America but I know Gift has gone back to the MLB African Academy and he has spoken to all the kids there which I think is great. All of those young position players and other kids really look up to him. When I am home I try to do what I can when I’m home but since the game isn’t very strong when I return home and visit the club there isn’t much of an interest in the younger kids to play baseball. It seems like less interest than when I was that age. I really want to give back to my community and South African baseball. I really want to be able to give back when I can. I have been able to help out kids who have contacted me on Facebook from all over South Africa. I’ve given them help with throwing programs and fitness programs to strengthen their body and arm. I hope to be able to do more in the future. It’s was really fun for me to see Gift on the highlights just the other day on the MLB network he made some really good picks in the field and when I see he does something well I always like to share with people how he is doing as well. 10. Do you have one moment that really stands out in your professional career so far with the Mariners? Last year was a really hard season and was really tough both physically and emotionally. The California League isn’t always easy on pitchers at times and the season is a grind. Sometimes even when your throwing really good you find yourself questioning what are you doing wrong when your playing in that league. It isn’t always about what you’re doing wrong it’s about having to adjust to not only a different league but to better hitters. After the first half of the season I had to tell myself not to doubt myself and that I just needed to go out and believe in myself and get back to being the pitcher I was for the last five years. There was a game (Against Modesto) I went I think seven innings and I had I think twelve strikeouts. It was a great performance and a great experience to put it all together after struggling for a bit during the first part of the season. In 2013 I threw a complete game, no decision against the Padres minor league team and even though I got the no decision it was a great experience to go that deep in the game and only throw maybe 80 pitches. Anytime I ever doubt myself it’s good to think of moments such as those two in order to remember that I can do it and I can be the pitcher I know I am going to be. 1. Did you have a favorite player growing up? It was definitely Tim Lincecum and Jared Weaver. I even like to grow my hair out when baseball season starts like they have done. They are the guys I grew up watching and wanted to become as a pitcher. Another guy would be Derek Jeter, I think most people probably consider him a favorite growing up just based on what a great career he had. 2. Tell us how you got the nickname “Sharkie”? I was born in Durban, South Africa and its known for having a lot of sharks. The Rugby Team and Cricket Team are named the Sharks. I moved to Cape Town, South Africa and my new baseball club knew where I was originally from so one tournament everyone was messing around and giving nicknames and they named me “sharkie” not only because of where I was from but I had the long tail like a shark with my hair. So ever since then everyone has called me sharkie. When I hear my name called a lot of times people call out Dylan “Sharkie” Unsworth. It’s almost like its become my second name. 3. When you’re in the United States chasing your dream of becoming a major league baseball player is there a particular thing or things your really miss from home? I definitely miss having braai when I am here. (A braai is another name for a barbecue) A braai is a traditional thing in South Africa where everyone gets to be together and you usually watch Rugby, Soccer or Cricket. You eat good food such a boerewors, chicken or steak and just enjoy the time around family and friends. It’s definitely one of the things I miss. A special thanks to Dylan Unsworth for taking some time out of one of his first days back in Arizona for spring training to talk to us. It was great to be able to talk and to hear him share his story. We look forward to following him all season long and into the future. Please remember to give him a follow on twitter @dylansharkie and like Chasing MLB Dreams on Facebook and follow us on twitter @CTD_Sypien as we continue to feature and follow all of our featured players as they chase their way to the major leagues. Wow, what a pleasant surprise to come across this article. I knew Rob and Lynn very well. We all played softball around the same time. I live in Perth now and lost contact ages ago with them. I know Rob would have been extremely proud of his son, and I wonder whether Dylan has inherited his fathers lovely smith and sense of humour.